Heat the olive oil in a wide pan and add the smashed garlic. Give a few stirs over medium heat and add pickled green tomatoes. Saute over medium heat stirring occasionally until they turn pinkish (for about 15-20 minutes). Then, add paprika and crushed chili pepper. Give a stir and turn the heat off after 1-2 minutes. 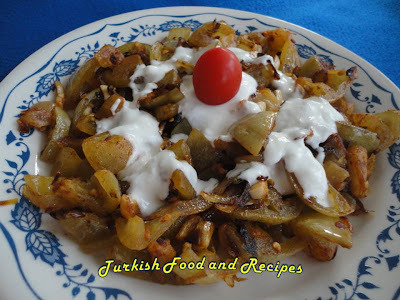 Serve with yogurt on top in desired. Genisce bir tavada zeytinyagini kizidirn ve sarimsagi ilave edin. Orta ateste bir kac defa cevirin ve dogranmis yesil domates tursusunu ilave edin. Ara sira karistirarak orta ateste tursularin rengi pembelesinceye dek yaklasik 15-20 dakika kadar kavurun. Sonra, kirmizi toz biber ve pul biberi ilave edin. Guzelce karistirin ve 1-2 dakika sonra atesten alin. Arzuya gore ister yaninda isterseniz uzerinde yogurt ile servis yapin. I am sure there is a tartness to this dish because of the pickling. Very interesting.